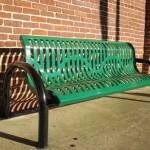 The Johnston Development Corporation, a non-profit volunteer organization that has helped the Town of Johnston grow in many ways for over 20 years, has donated to the Town two benches to accent the downtown area. The two steel benches are located outside the Mobley Library. The plaque on the Library reads: “Have a Seat! 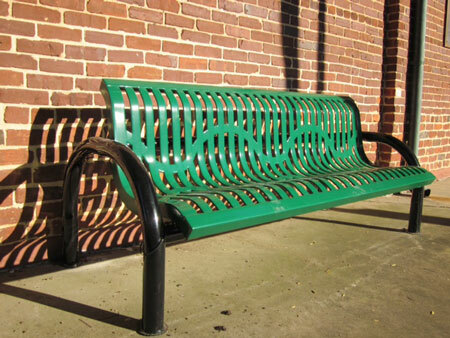 Courtesy of the Johnston Development Corporation In Memory of the Loyal Community Service of Jackie Boatwright May 2013.” Ms. Boatwright, who died earlier this year, was a former member of the Johnston Development Board and an advocate of providing benches for the downtown area. The funds to buy the benches came from proceeds from the Peach Blossom Festival, which is sponsored by the Johnston Development Corporation. In addition to the benches, the group has also provided other gifts to the town, including a Christmas tree made of lights, a set of Welcome banners and Festival banners for the town to use at its main intersection. The Johnston Development Corporation works to aid the community in areas such as economic development, education, recreation, historic preservation, tourism, scientific and cultural opportunities, and continued promotion of Johnston. 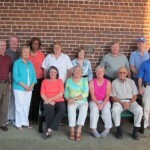 The Johnston Development Board has also worked hard throughout the years to promote the Town, surrounding areas and businesses, complementing the work of the Town, Chamber of Commerce, local civic groups, as well as other local and Edgefield County organizations.